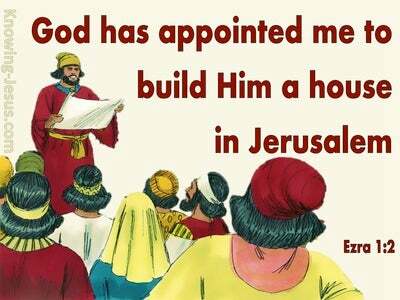 What Does Nehemiah 1:3 Mean? Nehemiah was a Jew, who had been born in the land of Israel's captivity, but had risen to the trusted position of cup-bearer to the king, himself. He was living under the rulership of the great Persian empire, which had overthrown the blasphemous, Babylonian kingdom, which had conquered and enslaved the nation, so many years before. Already the Temple of Jerusalem had been rebuilt, due to the decree of Cyrus, the great king of Persia, although its beauty and magnificence did not reflect that of Soloman's great construction. It was Ezra the priest, who oversaw the rebuilding of the Temple in Jerusalem, which fulfilled a prophecy that had been given hundreds of years earlier, by Isaiah the prophet: Cyrus, is My shepherd, who shall perform all My pleasure: even saying to Jerusalem, 'Thou shalt be built'; and to the temple, 'Thy foundation shall be laid'. 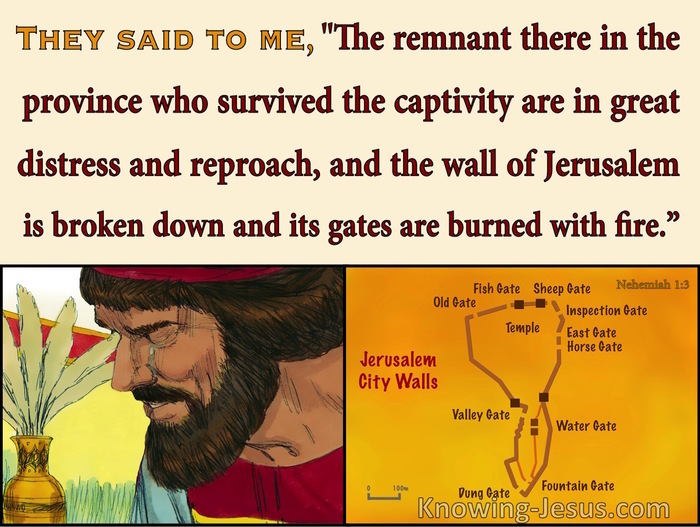 Following the rebuilding of the temple, as recorded by Ezra, the nation was still in exile, the walls of the city remained broken and desolate, the gates of the city lay scorched with fire and only a remnant of Jews, who had escaped the captivity, remained in the land. Indeed, these pathetic people were living under great affliction and were enduring much hardship. But Jerusalem was on the main highway between Egypt and Assyria and a constant flow of traffic and information, regarding the state of affairs in Jerusalem, reached the ears of Nehemiah - and his book opens with a glimpse, of this servant of God, receiving some distressing news from his homeland, which caused Nehemiah's countenance to become sad and his heart to almost break when he heard that.. the remnant there in the province who survived the captivity are in great distress and reproach, and the wall of Jerusalem is broken down and its gates are burned with fire. It was Hanani, one of Nehemiah's brethren from Jerusalem, who shared this distressing news with him, which caused Nehemiah to weep and mourn over the terrible state of his nation, and the shocking decline of his people - But it also caused him to turn to the Lord with a pleading prayer of repentance and an urgent petition for God, to move in the lives of His people. When this dear man of God reflected on the depths to which his nation had sunk, due to their rebellious apostasy against the Lord.. and the spiritual bankruptcy that had ensued, he confessed his sin and the transgressions of the nation and pleaded with the Lord to forgive their sins and fulfil the promises He made to their forefather Abraham, and his seed, forever. 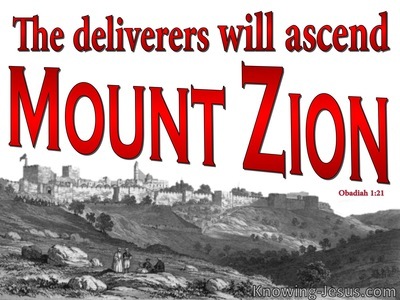 It was following his repentant prayer and urgent request for God, to fulfil His promises to Israel and to do mighty things within the nation, that God took Nehemiah, and used him in a wonderful way to be the man who was used, mightily of God, to oversee the rebuilding of the walls of the holy city of Jerusalem. There is much that we, in the church age, can learn from the life of Nehemiah. When he received this distressing news, he did not give up hope, or 'throw in the towel'. Nehemiah grieved deeply about sin and repented of his nations rebellion against the Lord. He reminded God of His promises that had been given to Israel and of the everlasting faithfulness of the Lord towards His people. He also became a servant, who heeded the voice of God.. and was willing to be used by God to forward His plans and purposes. 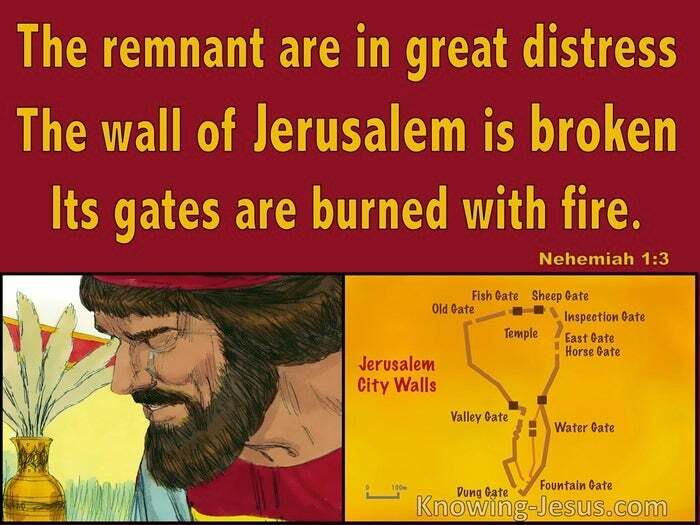 And as a result, Nehemiah was used mightily, in repairing the wall, and replacing the burned gates of the holy city - as recorded in his book. As members of the body of Christ, we too, like Nehemiah, have a choice.. when we hear of the terrible things that are going on in Christendom today.. where false teachers and doctrines of demons proliferate. We can compromise our faith by allowing unbiblical doctrine, legalistic practices, a works-based salvation, a watered-down gospel, angel-worship and a plethora of extra biblical practices, including Chrislam to influence us OR we can behave like Nehemiah. 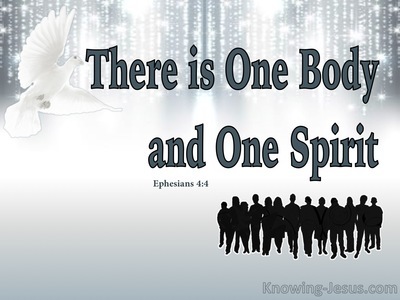 We can either permit New Age pantheism, contemporary polytheism, Pagan practices, transendental meditation, Marian apparitions, false 'christs' and another 'Jesus', which is infiltrating the life-blood of the Church of God to affect us.. OR we can act like Nehemiah. 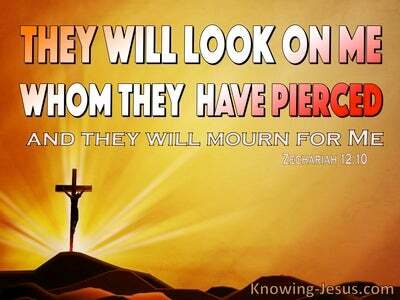 We have the choice to lose hope, compromise the truth and 'throw in the towel'.. OR we can grieve about our sin and the sin within the Church.. and repent of the apostasy into which we have fallen. We have a choice to either, maintain the Word of God as the plum-line for truth.. OR compromise our faith by accepting the status quo. We can seek the Lord in prayer and offer ourselves as a living sacrifice - to be used in whatever way He wills.. OR we can creep into a corner and pretend that things are not as bad as they seem. May we recognise the action that Nehemiah took, as the only option, if we are to swim against the treasonous tide of false teaching in many Churches today.. and pay careful heed to the Word of God, by trusting Him in this day of trouble. Heavenly Father, thank You for the example of Nehemiah, who not only grieved at the state of his nation and repented of their sin... but trusted You to fulfil Your promises to Your people Israel - by offering himself to be used by You, to fulfil Your plans for His people. May I grieve and repent for the sorry state of the Church today.. and maintain my faith in You to fulfil all Your promises to the Church. May I be part of a faithful remnant whom You use, to forward Your plans and purposes, in a world that is spiralling out of control - to Your praise and glory - so that the world may KNOW that You are the Lord. This I ask in Jesus name, AMEN.